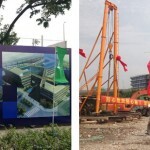 非常感谢 零壹城市建筑事务所 予gooood合作并分享以下内容。更多关于他们：LYCS Architecture on gooood. western Shanghai. The location of the project puts it at the center of car, train, and jet transportation, and is in fact the last building one sees before entering the busy Hongqiao High-Speed Rail Terminal from the south by bullet train, granting the project a significant urban presence. 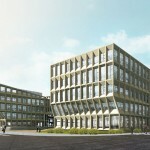 The site has several challenging conditions: sandwiched by two city-designated temporary green spaces into an L shape, with a 60% frontage ratio requirement to the east, west and south, and a 24m tall highway over- pass running adjacent to its north face, the building must respond to a maximum FAR of 1.60 and a height of 24m. In dealing with these conditions, the L-shaped site was first filled in to its maximum extents as a perimeter block, then lofted up 4 stories to the building height limit while satisfying the desired program area of 13,000 sqm. The perimeter is then pushed and manipulated to create three exterior-facing spaces and three distinct interior courtyards, defining the spatial structure of the project. 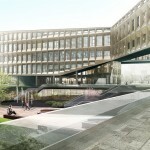 Portions of the ground floor are cut away to allow for an open pedestrian circulation within and through the project, connecting the landscape plots to the north and southeast, the western main entrance, and the cen- tral courtyard space of the project. The project is divided into three main office volumes, designated A, B, and C which can function independently or in combination. 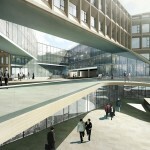 The three pieces are linked by suspended bridges on the 2nd, 3rd and 4th floors. Parts of the 5th floor are offices while the rest provide an intertwining rooftop garden space from which one can access views of the landscape and courts below as well as different parts of the building. The unique elevation, composed of free-flowing modular panels, deals with the lighting for interior.The project seeks to create an office environment as an inspired place, providing a variety of experiences and architectural moments to the users, speaking to the urban condition of multiplicity while harking back to the Chinese garden traditions of sequence, views, compartmental forms and spaces and a sentiment of harmony between architecture and landscape. First of all, we want to congratulate LYCS Architecture for this exciting project. For this interview, instead of the traditional Q&A, we introduce a more flexible way. In the new format, gooood proposes a set of ideas and questions at first, LYCS can organize their response freely. Building upon LYCS’s response, gooood proposes another set of questions. By this open method of interviewing, we wish it could inspire more reflections from the project for the readers. 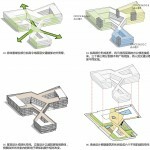 a) In the form generation process, the squeezing from “L” shape courtyard into 3 courtyards is a significant step. So my question starts with this operation. 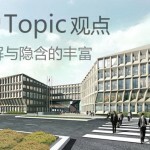 It reminds me of another LYCS’s project, Tongji University Zhejiang College Conference Center. In the conference center project, my interpretation of the form generation process is a process of uniform pulling, in the way which leads to a series of courtyards with similar dimensions but different directions. Besides the design purpose of designer, the pulling process is a relatively neutral form operation. However, in this project, the squeezing process is a set of uneven forces in three directions, which intentionally results a non-uniform form. My question is that in this project, the designer seems more subjectively concern with the design process compare with that in the conference center. In that case, is it still necessary to develop this project from the “L” shape? 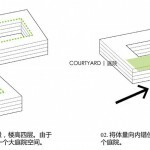 In another word, if the final form is not necessarily the outcome of the “L” shape courtyard, why did not it reach the present form directly, but still developing from the “L” shape courtyard? b) If I did not read LYCS’s design description, my first interpretation for the final form would be it is a perfect trefoil shape being squeezed and remodeled to adapt to the site. The final form is a mutated trefoil geometry shape. Comparing this interpretation to the “L” shape process, what is your position on the possibility of form’s multiple reading? c) There’s a “lift” operation within the form generation diagram. I was curious about this operation, which results certain degree of shrinking on the lower edge of the lifted part. Is the lift operation formally related to the shrinking? Is it true that the form could be interpreted as an outcome of a unified system, which suggests the scaling of the aperture on the façade is part of the whole system? These are all interesting questions, which seem based on the six “form generation diagrams”. But these diagrams are not explaining the process of how form generates, but recording the kept results which are transmitted to the final project from the beginning of the design process. The design process never is linear and the operations are not purely based on form. There are many attempts within the process. For us, design process is more like finding breakthroughs within the limitations. 3. The breakthrough in the standardized elevation design. There are many site factors and requirements in this project: the site requests that 60% of the building should be set along the building red line and the ground level of the building should be offset 2m from the street to create semi-exterior space, etc. These requirements already define the form along the perimeter. Hence, on one hand, using “L” shape as starting point is the most fundamental infill of program according to the site requirements; on the other hand, “L” shape could fulfill owner’s requirement, which is grand and continuous. The following formal operation is a reversible procedure of “squeezing” and “opening” rather than just “squeezing”. The “squeezing operation” increases the perimeter of the building by which increase the programmable square footage. It also generates three independent courtyards hinged within each other, for the most important part, it opens up the building on three sides. Plus, by squeezing the form, circulation and outdoor space starts to overlap at the central courtyard. The inhomogeneous geometry is the result of program optimization, which reflected on the final form. This is a negotiation and balance between function and form on a complex and difficult site. As we can see from the aerial model photo, after the three openings on the three edges, we designed three lifted corridors, which generate hinged internal courtyards, to satisfy the internal circulation. The enclosing corridors also attract people into the central courtyard and then lead people entering three office buildings. The lift operation creates a depressive space, which creates a spatial sequence as open-depress-open again when people walking from outside via three lifted corridor into the center courtyard. This sequence will indicate people of a sense of entering and creating richer spatial experience in the limited site. In this way, form, circulation and the spatial sequence are highly unified. This way of stimulating subtle relationship between space, circulation and program by interrelated geometry is one of goals that we are always pursuing in our design. 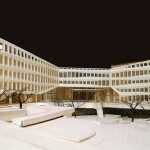 The result of these operations, which bring the balance between massing and spatial sequence, between program and promenade experience, is an innovation to the rule of “maximum office space availability”. Since the open floor plan office first introduced in Bloomberg headquarters office building in New York, which significantly increases the efficiency of office working model, how to maximize the area of office space is the major principle of office design. 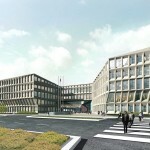 Here we are challenging this by proposing a new idea of” maximizing the quality of office space”, which is organizing outdoor landscape and green space integrated with indoor space, bringing more natural light and ventilation., and enhancing the user’s spatial experience, to create a creative working environment. We believe compare with maximum office areas, this will bring more efficiency to the users in the office. 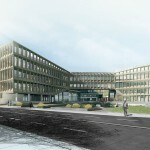 Besides, the elevation design is a breakthrough to the standardized uniformed elevation of contemporary office building. Under the “maximum office space availability”, office buildings nowadays are always stacked by standardized plan and elevation. In this project, besides the “promenade plan” that mention before, the elevation consists of modularized shading panels. There’re around 20 kinds of different panels gradually flows on each level. These panels have different slopes, which changes the height of windows and controls the interior daylight condition. The trefoil reading of this project is also possible. But in our design process, we rarely start from a pure geometry prototype then deform it according to site conditions. We are seeking for dialogue between site, circulation and program, then organizing them into geometries, which will achieve balance by excite the relationship between form, function and spatial orders. So we would argue that the transition from “L” shape to the final form contains more contradiction and inspiration. d) Could you give us an example about other possibilities that occurs during the design process? And how did you make the final decision between different design options? How many choices did you make during the design process? e) Also I think you bring up an interesting question, which is to describe a non-linear process in a linear way. In fact, this is a common presentation method within the field. Architects are using a descriptive derivation technique to represent a complex outcome. My question is that why we prefer this kind of method? Are there other ways to describe a sophisticate object? For instance, architects can present their desirable design by comparing multiple iterations of solutions. This project has gone through many rounds of revision and decision making. These decisions are mostly aiming at bringing two goals into one direction. One goal is how to keep the purity relationship between design concept and spatial effect. The other is how to make breakthroughs based on satisfying the owner’s will and site’s requirement. For instance, in this project, the “L” shape geometry vs. the three outward openings, the lifted corridor vs. circulation, etc, all follow the logic of balancing between form and function, limitation and breakthrough. At the early design phase, we have another proposal which consists of three pulled away interlocking “L” geometries. Let’s say the final proposal is a continuous form. Then that proposal is three “L” postures locating on three corners of the site. The reason that we didn’t choose the three “L”s is that we believe the continuous form has more spatial potential to develop, which also conform owner’s wish. I believe complexity will be well-presented in the final products, such as drawings and photos. This has something to do with the way of reading architectural representation technique. 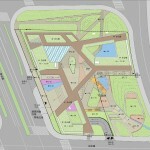 Just looking at the model photo or plan, most of the concepts we talked above could be read and discovered. In other words, photos, drawings and physical experience are one of the best ways of representing a sophisticate object, which contains every design strategy during the design process. The form generation diagram is the simplified representation of a design. It is like a trailer to a movie. The best way of understand a movie is watching itself, not just watching the trailer. 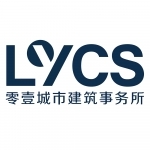 MORE: 零壹城市建筑事务所 LYCS，更多关于他们：LYCS Architecture on gooood.